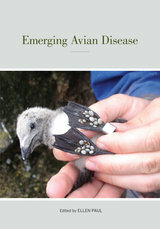 In this volume, new human disease pandemics, arising from animals stimulated by ongoing environmental change, demonstrate the value of ornithological research into avian diseases. A group of 29 researchers addresses a diverse set of topics, including the evolutionary and ecological aspects of the host-vector systems, the effects of genetic variation, introduction success and vector ecology, evolution of resistance and virulence of pathogens, and the effects of changing geographic distributions. In addition to empirical studies under field conditions, the authors present predictive models to assess the movement and potential impact of these diseases. Other chapters delve into the potential impacts of pathogens and the key role of biosurveillance and documenting impacts of disease on bird populations. Ellen Paul is Executive Director of the Ornithological Council.